To celebrate Earth Day, Disneynature will release “Bears” next year. “Bears” hits theaters April 18, 2014. Get a sneak peak now with the new featurette trailer below! 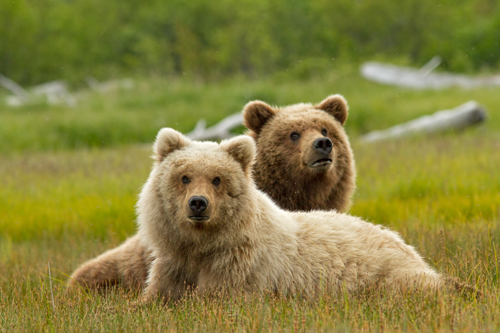 “Bears” showcases a year in the life of two mother bears as they impart life lessons to their impressionable young cubs. How cute! I love shows like these and the wonderful animals Disneynature showcases. In an epic story of breathtaking scale, Disneynature’s new True Life Adventure “Bears” showcases a year in the life of two mother bears as they impart life lessons to their impressionable young cubs. Set against a majestic Alaskan backdrop teeming with life, their journey begins as winter comes to an end and the bears emerge from hibernation to face the bitter cold. The world outside is exciting—but risky—as the cubs’ playful descent down the mountain carries with it a looming threat of avalanches. As the season changes from spring to summer, the brown bear families must work together to find food—ultimately feasting at a plentiful salmon run—while staying safe from predators, including an ever-present wolf pack. “Bears” captures the fast-moving action and suspense of life in one of the planet’s last great wildernesses—where mothers definitely know best and their cubs’ survival hinges on family togetherness. Directed by Alastair Fothergill (“Earth,” “African Cats” and “Chimpanzee”) and Keith Scholey (“African Cats”), “Bears” is in theaters April 18, 2014, to celebrate Earth Day. In an epic story of breathtaking scale set against a majestic Alaskan backdrop teeming with life, Disneynature’s 2014 big-screen adventure “Bears” follows two mother bears as they impart life lessons to their impressionable young cubs. “Bears” is the fifth release for Disneynature, the first new Disney-branded film label from The Walt Disney Studios in more than 60 years. The label was launched in April 2008 to bring the world’s top nature filmmakers together to capture a variety of wildlife subjects and stories. In an epic story of breathtaking scale, Disneynature’s new True Life Adventure “Bears” showcases a year in the life of two mother bears as they impart life lessons to their impressionable young cubs. Set against a majestic Alaskan backdrop teeming with life, their journey begins as winter comes to an end and the bears emerge from hibernation to face the bitter cold. The world outside is exciting—but risky—as the cubs’ playful descent down the mountain carries with it a looming threat of avalanches. 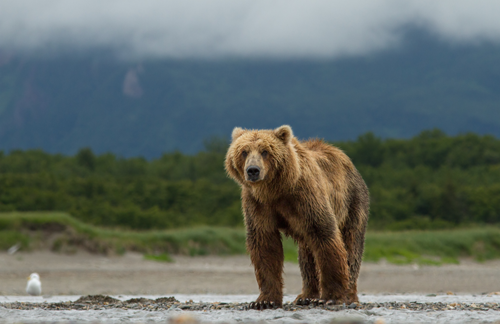 As the season changes from spring to summer, the brown bear families must work together to find food—ultimately feasting at a plentiful salmon run—while staying safe from predators, including an ever-present wolf pack. “Bears” captures the fast-moving action and suspense of life in one of the planet’s last great wildernesses—where mothers definitely know best and their cubs’ survival hinges on family togetherness. Directed by Alastair Fothergill (“Earth,” “African Cats” and “Chimpanzee”) and Keith Scholey (“African Cats”), “Bears” is in theaters April 18, 2014, to celebrate Earth Day. For more information about Disneynature, like us on Facebook: facebook.com/Disneynature and follow us on Twitter: twitter.com/Disneynature. Disneynature was launched in April 2008. Its mission is to bring the world’s top nature filmmakers together to share a wide variety of wildlife stories on the big screen in order to engage, inspire and educate theatrical audiences everywhere. Walt Disney was a pioneer in wildlife filmmaking, producing 13 True-Life Adventure motion pictures between 1948 and 1960, which earned eight Academy Awards®. The first four Disneynature films, “Earth,” “Oceans,” “African Cats” and “Chimpanzee,” are four of the top five highest overall grossing feature-length nature films to date, with “Chimpanzee” garnering a record-breaking opening weekend for the genre. Disney’s commitment to conservation is a key pillar of the label and Disneynature films empower the audience to help make a difference. Through donations tied to opening-week attendance for all four films, Disneynature, through the Disney Worldwide Conservation Fund, has planted three million trees in Brazil’s Atlantic Forest, established 40,000 acres of marine protected area in The Bahamas, protected 65,000 acres of savanna in Kenya, protected nearly 130,000 acres of wild chimpanzee habitat, educated 60,000 school children about chimpanzee conservation and cared for chimpanzees. For more information about Disneynature, like us on Facebook: facebook.com/Disneynature and follow us on Twitter: twitter.com/Disneynature. I loved Oceans i still want to see chimpanzee and now the bears movie! This new Disney Bears that follows a mother and her cubs is a movie that I must watch . I love movies that show animals in their natural habitat. What another great movie from Disney! I love watching the animals in there natural habitat. I would love to see this. I would love to see this! I haven’t sen the other Disney Nature films yet and I would like to see them as well. I’m glad these films are helping to protect these habitats and are helping to spread awareness! Wow! This looks like a great movie that follow a mother and her cubs. I like this movie. This will be a movie that I want to see with my family. This is going to be great! I love watching wildlife and nature shows. Can’t wait! This looks like an interesting film! And, apparently some brave soul(s) has taken the time (and a few risks!) to put this amazing production together! I love nature films especially by Disney – and I can’t wait to see this – I love grizzly bears, too. I don’t normally go to the theater to see any movies but I just might have to take my two boys to see this! I can’t wait for it to come out 🙂 Thanks for the preview! i love seeing the Bears in this trailer. so beautiful, i love watchg animals! looks like a great family movie. I love taking my children to nature films, especially movies that feature animals. Should be very good. Like to see it. I always find shows like this interesting, especially if they have a nice area for a background! I think Alaska is beautiful. I so want to see this movie, but I always start crying right at the beginning of nature films knowing that ultimately without major intervention the subject of the movie is doomed. What a great looking family movie, thanks for sharing this! This looks so neat. I hope I can take my daughter to see this – I think Disney does a really good job with cartoons, but I think they do a good job with these types of movies too – the time it must take – incredible. My grandkids want to see this and I am planning to take them next week. I think it will be very educational for them to see how the species teaches their young but it will also be fun because who does not like bear cubs? Loved seeing the bears yesterday at the zoo! This looks like an adorable movie I would love to take my kids to see, thanks for the review! Disney does a really good job with moves like this. I would like to see this one. So much fun…I know the hubby and little guy would love it!